San Jose, California—The president of the Communications Workers of America union pegged the likelihood of Senate Democrats changing confirmation rules at “fifty-fifty,” and pledged retribution if such reform fails. The NLRB is charged with enforcing and interpreting most private sector labor law. Since a January DC Circuit Court ruling rejected President Obama’s NLRB recess appointments, dozens of companies have gone to court challenging the agency’s authority to investigate or punish their conduct. Cohen warned that, with Republicans committed to blocking Obama NLRB nominees, any Supreme Court ruling on the recess issue many months away, and the pending expiration of the NLRB members’ terms, “there’s no NLRB” soon unless Senate rules are changed so the president’s recent nominees can be confirmed. While labor law enforcement is “grossly imperfect” anyway, warned Cohen, a crippled NLRB would mean “that management can do whatever they want in terms of workers’ rights.” As The Nation reported, CWA warned after the January 30 termination of twenty-two Cablevision union activists that such alleged law-breaking will become more widespread without a functional NLRB. With the fate of the NLRB looking grim, unions are in deep trouble. 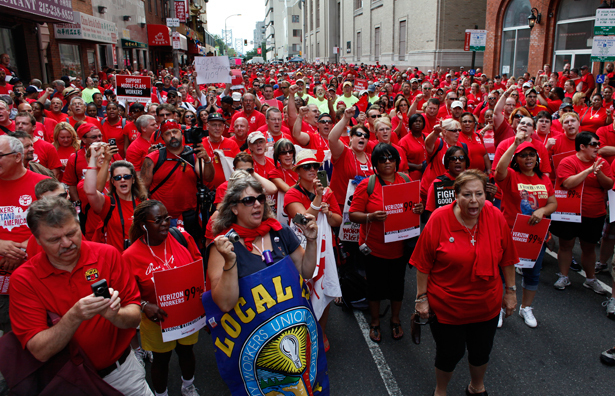 Can the labor movement be saved?